Everybody who comes to Bossier knows about Louisiana Boardwalk Outlets, the CenturyLink Center, or Pierre Bossier Mall. No doubt, those attractions are important to locals and visitors alike, but what’s really great about life in Bossier is when you do a little digging. You don’t have to look very hard or very far across the parish to find some diamonds in the rough. I’m talking about those hidden gems in Bossier that give it that Southern charm we always hear about. Below you’ll find some great entertainment just off the road that Robert Frost was always talking about. Taqueria Sin Fronteras — I was first introduced to Sin Fronteras by my wife who came home from work one day raving about “burritos from a gas station in Haughton.” I was pretty skeptical but it only took one bite before I was completely won over. Their speciality is fresh, authentic Mexican street food, and it is a welcome addition to Bossier’s culinary options. Located at 754 Highway 80 in Haughton, the taqueria can be hard to spot from the road but its red and green sign and facade (that looks like an old school grocery store or gas station) will soon be burned in your memory. Red River National Wildlife Refuge — Tucked away in south Bossier is a literal oasis for outdoor enthusiasts. The Red River National Wildlife Refuge Headquarters lies in the Red River Valley and is rich in plant life and offers safe haven for waterfowl and songbirds. The property was acquired in 2002 and its Headquarters and Education Center opened in early 2012. Visitors can observe various birds, reptiles and amphibians, and even white-tailed deer. More enthusiastic nature lovers can fish, take a hiking trail, pick pecans and plums, or engage with some of the center’s exhibits. You can access the refuge at 150 Eagle Bend Point in Bossier City, just off the Arthur Ray Teague Parkway. BPCC Performing Arts — One of the best kept secrets in Bossier has to be Bossier Parish Community College’s performing arts program and the subsequent plays staged by the students. 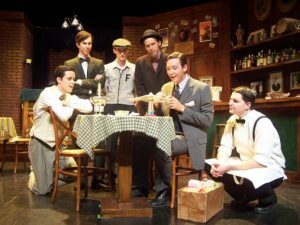 While the goal is to give students an education and training in acting, directing, lighting, costuming, makeup, and set building, the program gives the public access to award-winning productions. Most recently, the BPCC Theatre Program received seven distinguished achievement awards at the Kennedy Center American College Theatre Festival in Washington D.C. last summer, in addition to several other awards for performances at various festivals. You can catch their upcoming summer play, The Haunting of Hill House July 21-23 and 28-30. For more info, visit their website HERE. Blueberry Hill — Nestled in Haughton is a piece of land that’s a throwback to a simpler time. 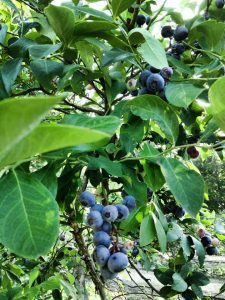 Blueberry Hill is a small farm that allows visitors to pick fresh blueberries, blackberries, and vegetables as well as buy homemade jelly and juices or honey made from the bees that call the spot home. Get a rare change of pace by enjoying a relaxing Saturday, strolling through foliage and taking your literal pick of cucumbers, peppers, green beans, eggplant, okra, squash, pinto beans or tomatoes. Produce doesn’t really get more organic than that. And if you’re not really into the outdoors thing, it’s okay, they have an option where you can tell the staff what you want and they’ll pick it for you. Blueberry Hill is open Monday through Saturday from 7 a.m. to 5 p.m. Visit their Facebook for price listings and more HERE. More Junk in My Trunk — And finally, what would a list of hidden treasures be without a place that is nothing but hidden treasures? More Junk in My Trunk is an antique store in Benton that specializes in…Well…Just about anything you can think of. Vintage furniture, lamps, framed art, glassware, home fixtures, toys, records, magazines/books, and more are ready and waiting in one of SEVEN (!) rooms for those who like to find the perfect, unique piece for their home or office. 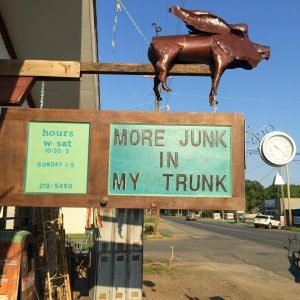 Located at 118 5th St., Benton, the store is open from 10:30 a.m. to 5 p.m. Wednesday through Saturday and Sunday 1-5 p.m. You can visit their Facebook at www.facebook.com/morejunkinmytrunk. Next Post:Is Bossier Safe? Here’s what the statistics say.